WC125 tap is a premium mixer kitchen tap with 2 handles that supplies hot, cold and filtered water. Modern, quality tripflow kitchen sink tap for purified water from undersink drinking water filtration units. A three way tap allowing the flow of hot, cold and filtered water through the same spout, therefore maintaining the taps design balance and elegance! This Gosford three way tap is a high quality product, right choice for under sink filtration systems. Hot, cold and filtered water is provided from one, well designed tap. You operate the hot and cold water with two levers; to avail of filtered water simply move the cold lever backwards. 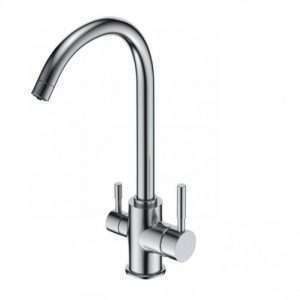 A high quality triflow kitchen tap brushed chrome. The tap is free from metal – water doesn’t flow through metal content. The tap has two handles making it easy to mix cold and hot water from one side and deliver filtered water from the other side. An elegantly designed, easy functioning triflow tap which makes a bold statement in any modern kitchen. The tap supplies hot, cold and purified water with the purified water being delivered by an independent line to avoid mixing with unfiltered hot and cold water tap water. The only three way shower mixer tap made of solid stainless steel on the market! 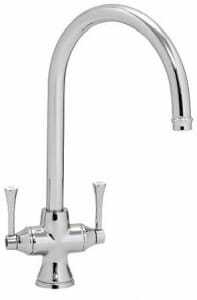 Elegant and unique triflow tap with a flexible head.